District Collector for Chandrapur, Maharashtra, Ashutosh Salil (IAS) delves into the increasing role of data and technology in transforming district governance. He looks back at the various challenges and roadblocks faced by district administrators in India and imagines a future where data can empower local communities and administrations alike for smarter decisions and better policies. Q1. What are some of the biggest challenges involved in district governance in India? Ans. District planning used to be very general before — we’d rarely go into the specifics. We’d have a broad idea as to the number of people who don’t have access to a service. Say you’ve got 100 rupees, many blocks and no data… then what do you do? You divide these 100 rupees equally amongst every block. But this may not be the right allocation of resources. One block may not need any money. If you’ve got no data, then you’ll end up making decisions like this, which will have no grounding in rationality or logic. At the end, you do need some basic data to base your decisions on. What you did just last year cannot be the the same as what you do this year. Q2. How did data intelligence affect how you make decisions? Ans. Data helps me ask better questions. It helps me in being better prepared when I undertake a field visit. It helps me understand the problem better. It gives me details in specific, which make it easier to identify the beneficiary whom we need to reach out to. It also becomes much easier to fix responsibility on people in the machinery (ie the district administration). It also helps us reach the people who aren’t covered by our welfare programs. We can plan better, we now know how much money to allocate and what the needs of a particular village are. I am able to know the community better, their names, their backgrounds. We rely on independent data that I have, which is cross-checked, verified and correct data. Q3. How can data and technology improve planning, budgeting and district governance in India? Ans. All this data is immensely helpful, but data should not remain just data. It also has to make a difference to people’s lives. See, the moment you have figures, numbers and data before you, you can plan better. You’re not shooting in the dark. You have some logic and rationale behind the allocation you do. I feel we do have a lot of data, but data should be in a form which is useful for planning. If you have all the data collated in a place and presented in a form that is easier for one to understand and work through, then I can see a lot of good changes happening on the ground. We partnered with the Tata Trusts and Government of Maharashtra to empower the local administration of Chandrapur with data intelligence tools to improve budgeting, planning, program implementation and drive digital district governance. Read the full case study here. 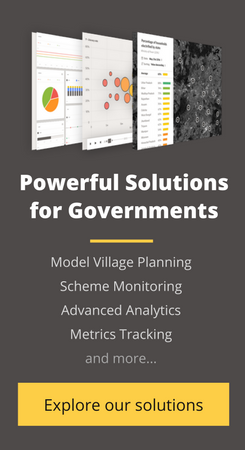 Want to know how the district government of Chandrapur used data intelligence to drive rapid model village development across 290 villages of Chandrapur? Learn more about our platform here.